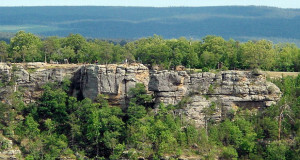 Petit Jean State Park was the very first state park in Arkansas. The place offers breathtaking views of enchanting wooded areas filled with streams and wildflowers. 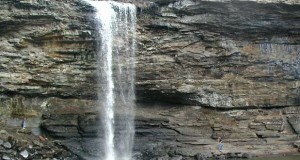 There is also a jaw dropping view of the Cedar Falls waterfall. Petit Jean State Park offers their guests 125 different campsites (26 of which include pull through campsites). All of the campsites offer both water and electrical hookups. The campsites are divided into four different campgrounds. Each of the campgrounds has modern bathhouses. Guests can also reserve the group camp area which has a heated bathhouse for the winter. For guests who do not have their own camping equipment, the park does offer rent-a-yurt and rent-a-camp packages. Each of the packages includes a yurt or a tent, sleeping mats, a camp stove, and a variety of other camping gear. The rent-a-camp is ideal for up to four people and the rent-a-yurt is ideal for up to six people. In addition to camping, fishing, hiking, swimming, picnicking, and playing at the playground our other activities that individuals come to Petit Jean State Park to enjoy. Fees for camping vary from $15 to $30 per day. The rent-a-camp and rent-a-yurt packages are available for $50 and $55 per day. Guests are encouraged to contact the park directly for any other fee inquiries.